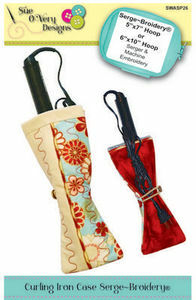 Every fancy, girl-on-the-go simply MUST have a stylish curling iron travel case and this one BEATS them all. Inside find heat resistant lining so all that is required is to unplug - wrap your cord and bungee around the adorable band/button closure. Create this project using your Serger and Embroidery machine; it's fast, fun and useful. it's Serge-broidery! Learn these great techniques: Attach binding in the hoop, Create quilting stitches inside the hoop, Add heat resistant lining with no exposed raw edges, Finish with adorable button closure. Ready in two sizes and three center front options: Flatlock wave, 2-thread flatlock, and decorative stitches. Let's get stitching! Final Dimensions: Large - 4in wide x9in tall, Small - 4in wide x6-1/2in tall.